Engaging with the wide sociological literature on emotions, this book explores the social representation of emotions, their management and their effects by making reference to creative sources. 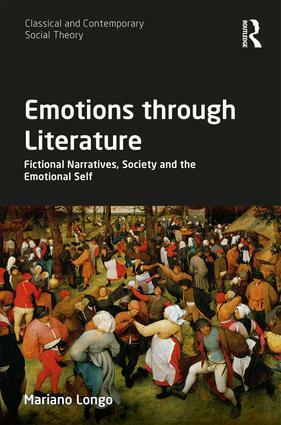 With a specific focus on literary narrative, including the works of figures such as Dante, Austen, Manzoni and Tolstoy and Kundera, the author draws out the capacity of literary works to describe and represent both the external aspects of social relations and the inner motivations of the involved actors. An interdisciplinary study that combines sociology, narratology, philosophy, historical analysis and literary criticism, Emotions through Literature invites us to re-think the role of emotions in sociological analysis, employing literary narratives to give plausible intellectual responses to the double nature of emotions, their being both individual and sociale. Mariano Longo is Full Professor of Sociology at the University of Salento, Italy, and author of Fiction and Social Reality: Literature and Narratives as Sociological Resources.